Ebolowa, Cameroon - The market in Ambam, a colonial town with brick-red cottages and rusty roofs, near the southern borders with Equatorial Guinea and Gabon, is a cluster of booth-sized shops and stalls. Under one stall, a small deer with a slit throat lies next to a porcupine in the mid-January heat. Nearby, other game, concealed in jute bags and bamboo baskets, are for sale. There is what looks like the tail of a monkey poking out from a pile of "bush dogs", poorly concealed beneath a flight of concrete steps. These are the leftovers from the peak hour for selling and buying bushmeat, which occurs well before dawn, when forestry and wildlife law enforcement officers are still asleep. The demand and supply of bushmeat have held steady here and throughout the south of Cameroon, despite health officials warning for about two years now that bushmeat trade and consumption increases the risk of an Ebola outbreak. In 2014, as the deadliest Ebola epidemic spread through four West African countries, including neighbouring Nigeria, authorities in Cameroon closed the borders and began a massive campaign to shut out the disease. No cases were reported in Cameroon. But forest towns like Amban - with their teeming fruit bat and wildlife populations, a huge appetite for bushmeat, and porous borders - lie at the heart of what officials describe as a "potential hotbed" of Ebola. When fruit bats, which are believed to be the natural hosts of the Ebola virus, infect other wildlife, humans can pick up the virus from the secretions, blood or other bodily fluids of affected animals, warn health officials and organisations, such as the World Health Organisation (WHO) and the Centers for Disease Control (CDC). Humans can then infect each other, often rapidly. The West African outbreak killed more than 11,000 people between 2014 and 2016. Cameroon is among 15 countries most at risk of an Ebola outbreak because of wide-ranging natural and man-made risk factors. The anti-Ebola campaign in the country, and six others with similarly high risks, has not targeted the hunting or consumption of wildlife directly, but focused on dead animals found lying on the forest floor that hunters or farmers could bring home as food. Messages carried on posters, t-shirts and aired on local radio stations warn the population to stay away from dead game. "Generally, Ebola is not spread by food; however, in Africa, human infections have been associated with hunting, butchering, and processing meat from infected animals," notes a CDC factsheet. 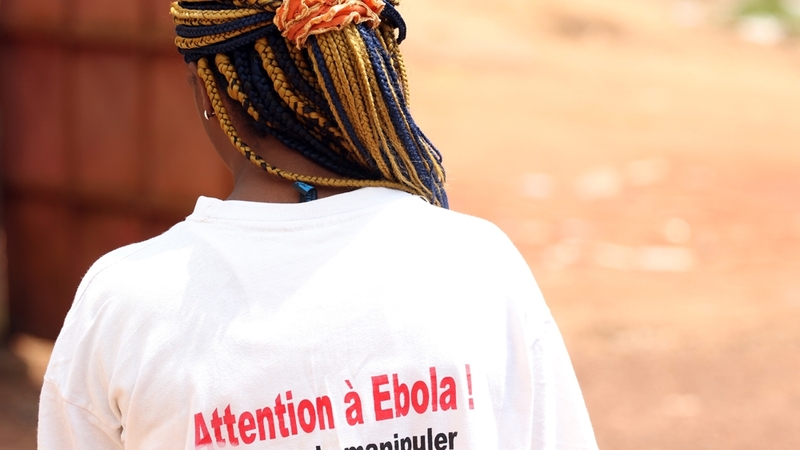 But that message got lost on its way out, says Marcelle Zimbi, a member of the anti-Ebola team at the regional public health office in Ebolowa, Cameroon. Many, she says, consider the government's anti-Ebola campaign to be a hoax - as part of an anti-poaching effort to stop the hunting, trade and consumption of bushmeat. Anti-poaching campaigns are permanently in place as part of the country's wildlife conservation effort and to curb the hunting of endangered animals. Many see the association of Ebola with bushmeat as an extension of conservation efforts and nothing to do with public health. Associating Ebola with bushmeat in any way has met scepticism, suspicion and a quiet rebellion in these parts of Cameroon; it emerged from more than a dozen interviews with health workers, hunters, bushmeat dealers and consumers. The people in the south adore bushmeat, explains Nathaniel Abang Moussa, a local official of the youth ministry, speaking at his office in Kyo Essi, on the border crossing with Equatorial Guinea, about 25km from Ambam. "We are in a forest zone and good meat is bushmeat," he said. The rampant consumption, handling and trade in game is easily the biggest threat to the Ebola prevention campaign led by the government and international partners like UNICEF, WHO and USAID in Cameroon, according to Dr Anicet Ntoude II, head of the regional disease and epidemics control service. 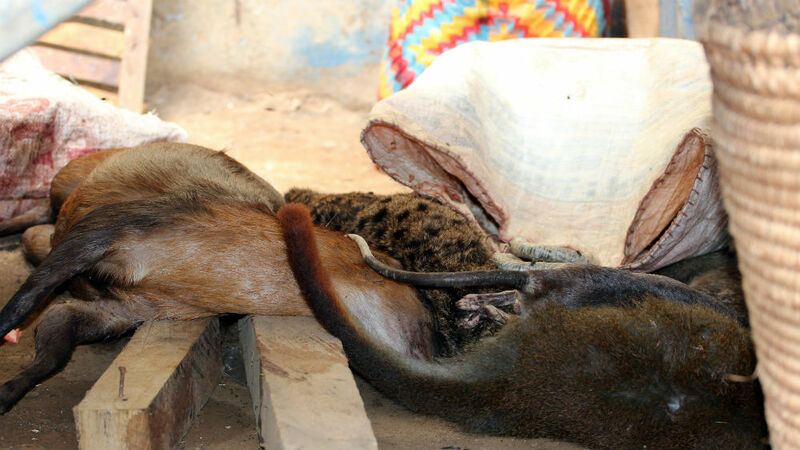 At the Ambam bushmeat market, bloodied animals pass from hand to hand every day, usually under the cover of darkness. Hunters, wholesalers, retailers and consumers come from near and far, including Gabon and Equatorial Guinea. Mid-level dealers stock animals in freezers at home, or truck their dripping cargo across the border through unpoliced routes, mostly through the forest and far from epidemiological controls posts. Bushmeat is on almost every restaurant menu across Cameroon and is often served at government functions. 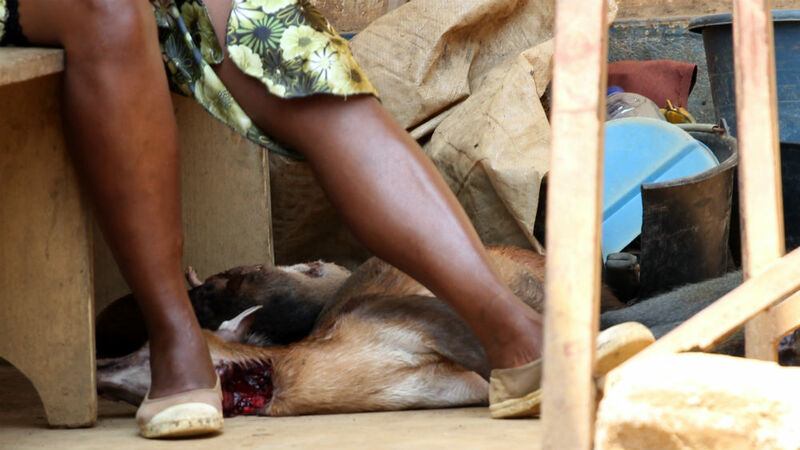 "We have been doing this [selling and consuming bushmeat] for centuries and no one ever fell sick," says Rose Mengele, a 32-year-old mother of one, who gave up tailoring to sell bushmeat at the market in Ambam. "If it posed any risks, people would have died." Like her fellow sellers and customers, Mengele wears no protection. The only precaution she takes, she says, is checking for either gunshot injuries or wire trap bruises - to make sure hunters did not find the animals she is buying lying dead in the jungle, which would make it harder to sell her meat. But she really has no way of being certain. Hunters often inflict wounds and bruises on dead game to mimic the damage caused by gunshots and traps, we heard repeatedly in interviews with wildlife and health officials. Even then, determining how the animals they are buying were captured is hardly consumers' chief concern when they go shopping, says Zimbi, the anti-Ebola campaigner. 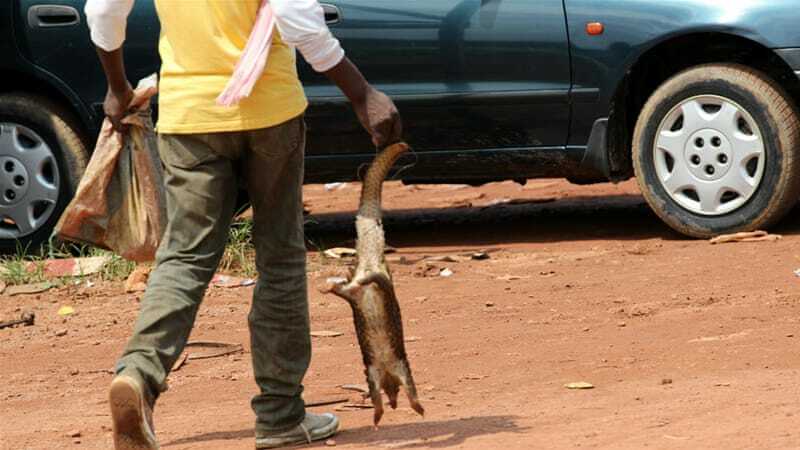 Indeed, in a survey by Global Viral, a non-profit research organisation headquartered in San Francisco, in three Cameroonian regions, including the south, 43 percent of 480 participants reported picking up dead animals found in the forest. Thirty-five percent said they went as far as chopping up the carcases and 34 percent admitted taking them home as food. Blaise Beyeme, a hunter who during a good week can kill more than 12 antelopes, monkeys and porcupines, believes Ebola poses no direct threat to his health or that of his family and community - he says he has friends who can cure worse diseases. "What is Ebola?" Beyeme asks mockingly. "Ebola is nothing. We have traditional medicine that can cure any disease. Ebola is nothing." At the Cameroon-Equatorial Guinea border crossing in Kyo Essi, torn and peeling posters warning the public about the risks of Ebola still line the walls of schools, hospitals and offices two years after they were put up. Inside a dim hall that used to be the village nightclub, a tabloid-sized sheet lies on the damp floor, once an anti-Ebola poster - heat, moisture and dust have rendered the text on the glossy paper indecipherable. Dense rainforests vanish into the horizon behind the ruined nightclub. At the crossing, sweaty young men come and go with overloaded hand trucks, hauling sacks of fruits and vegetables into Equatorial Guinea and boxes of whiskies, wines and canned beer into Cameroon. Not far from a man trying to sell a curled pangolin to beer drinkers, a young woman poses for a photo. Barrons la voie à Ebola! (Let's bar the way to Ebola! ), reads her t-shirt in a red, bold font. Misconceptions about the relationship between bushmeat and a potential Ebola outbreak have made messages like these "dead on arrival", says Dr Severin Metoug, a member of the regional Ebola taskforce. Short of cases of victims falling sick and dying of Ebola across the region, people are likely to remain stubborn, he adds. The fight against poaching and the bushmeat trade that drives it has been waged here and elsewhere for reasons other than Ebola - mostly for conservation. The rampant and often illegal killing of wildlife for bushmeat is driving many species into extinction and undermining conservation efforts throughout Cameroon. On the road from the capital, Yaounde, to the southern border at Kyo Essi, forestry and wildlife officials have raised more than half a dozen checkpoints. Hundreds of rangers and eco-guards deployed in the region spend the day hunting down illegal poachers and chasing traffickers across the border. Now, bushmeat has a new infamy. As sunset shone orange rays on a policed tollgate just outside Ebolowa on a recent evening, a crowd gathered around a man and a woman with a bloodstained sack. One by one, the man pulled out chunks of a slain bush pig, which must have been the size of a cow when it was killed.